petition: Whale Protection Zone Needed Now for Tahlequah and Endangered Orca Whales! Whale Protection Zone Needed Now for Tahlequah and Endangered Orca Whales! Recent images of Tahlequah, the whale who carried her dead baby for over 17 days on a tour of grief through the Salish Sea, has touched the hearts of people all over the world. The southern resident orca whales, including Tahlaquah's family, are unique in the world and a critically endangered species hovering on the edge of extinction. Only 74 whales are left. There have been no successful live births in over three years. The orca whales are starving. With a decimated salmon population, polluted waters and constant vessel traffic, they are struggling to feed themselves. We support the petition to designate a Whale Protection Zone and marine sanctuary, initially proposed by the National Oceanic and Atmospheric Administration in 2009, and the current petition submitted to the NOAA in 2016. The proposed WPZ is in Haro Strait off the west side of San Juan Island, a known rich feeding ground for the endangered whales. 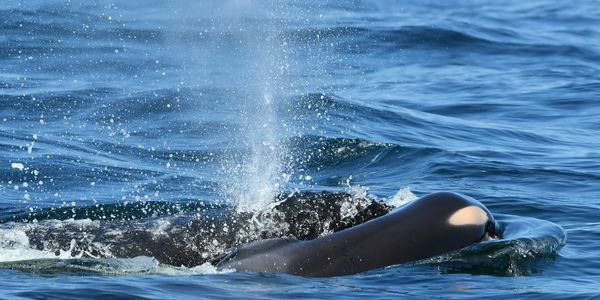 Multiple studies have concluded that underwater acoustic vessel noise interferes with the southern resident orca whale's ability to hunt and communicate successfully and is the #2 cause of their rapid decline. A Whale Protection Zone, or marine sanctuary, would allow these whales to hunt, forage, mate and give birth in relative peace. The whale watching industry in and around the San Juan Islands has increased to 67 companies, with an active fleet of 103 boats that follow the endangered orca from dawn till dusk, seven days a week. When chinook salmon counts are low, the presence of motorized boats increases the orcas' need for food while decreasing their ability to forage, leading to consumption of their own toxin-laden blubber as they starve to death. In the last two years alone, eight adult whales and an unknown number of calves have perished. Recovery of the orcas' preferred prey, chinook salmon, may take decades. Please show your support for Tahlequah and her family by letting our elected officials know you support the Whale Protection Zone in Haro Strait. Please sign the petition and ask NOAA to take action now to save the whales. Thank you on behalf of Tahlequah and the endangered southern resident orca whales. J50 (Scarlett) has not been sighted for a week and local researchers believe she has died. Scarlett spent the last weeks of her life being pursued by NOAA research boats, having darts loaded with antibiotics shot into her, and faced a live capture plan that surely would have severely traumatized her J-pod family. NOAA now plans to shoot darts into the southern-residents to track their night time behavior. These whales need a sanctuary so they can have some peace from constant human harassment! A tremendous win for the orca yesterday when Canada's Federal Court halted construction on the Trans Mountain pipeline project. The court ruled that the National Energy Board failed in any way to address the marine impacts of a dramatic increase in tanker traffic moving through the Salish Sea, particularly the adverse effects on the Southern Resident whale population. Many biologists had predicted the increased vessel noise from this tanker traffic would have been a death knell to the whales. The Southern Resident orca whales are matrilineal and learn all their behavior from their mothers and grandmothers. On the night Tahlaquah’s baby died, a local resident reported a group of five to six female orcas gathered near the Southern tip of San Juan Island. For nearly two hours the whales formed a tight-knit circle around Tahlequah and her dead baby, staying at the surface of the water in the moonlight. The islander watching said the gathering looked like a ritual or ceremony. Another whale, J-50 (or Scarlett) is critically ill and on the verge of death. She is so thin the bones of her head show. An emergency effort coordinated by the NOAA , the Washington State Department of Fish and Wildlife and the Lummi Nation to feed and medicate this young orca are underway, but scientists fear she may not have long to live. Thank you for your outpouring of support for our resident whales here in the San Juans. A recent news report characterized Tahlequah as being back to "frolicking" with her pod, but that is a feel-good projection. These whales are are struggling to feed themselves amidst the acoustic hell of whale watching boats. Your voices will be heard by the NOAA and others who are working to create a marine sanctuary for the orca. We must turn around the mass extinctions happening on planet earth.